The hard, brown coconut you find in the produce section of the supermarket is actually the stone of a mature coconut fruit, similar to a peach stone. When you crack open the coconut, you will see a thin coating surrounding the inner flesh, then the white, coconut meat. This fiber-rich coconut meat aids in digestion and provides iron and other minerals to your diet, but be aware that it is high in fat. One medium-sized coconut weighing about 397 grams has 1,405 calories. If you cut the coconut meat into about 2-inch pieces, the calorie count is 159 per piece. The total fat in one coconut is about 133 grams. One 2-inch piece has approximately 15 grams of total fat with 13 grams of saturated fat. According to the American Heart Association, if you follow a 2,000-calorie-per-day diet, you can eat up to 78 grams of total fat each day, but no more than 16 grams of these fats should be saturated fat. 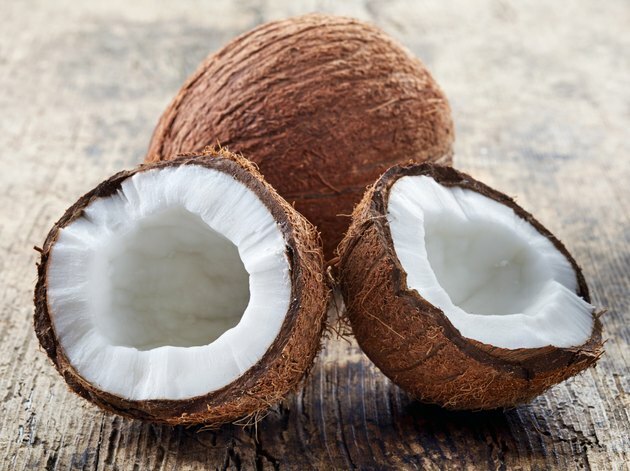 Since coconut is high in saturated fat, limit your coconut intake to small portions served with a balanced diet. Fiber-rich foods help control your blood sugar and cholesterol, plus keep you full longer. The recommended daily intake of fiber is about 25 grams for women and 38 grams for men. A 2-inch piece of coconut provides you with 4 grams of dietary fiber. The whole coconut has almost 36 grams of fiber. The American Heart Association recommends eating more fiber because it could lower your risk of stroke and high blood pressure. The high fiber and zero cholesterol in coconut provide you with a heart-healthy food to complement your diet. A serving of coconut adds almost 2 milligrams of iron to your diet, which is about 11 percent of the recommended daily intake. Your metabolism uses iron to help carry oxygen through your bloodstream to all parts of your body. Coconut also provides 160 milligrams of potassium, which helps regulate your heartbeat, and 51 milligrams of phosphorus for strengthening your teeth and skeletal system Coconut has only minimal vitamin content. Incorporate coconut into your diet by adding shredded or shaved coconut meat to fruit salads, yogurt, garden salads and vegetables. Combine shredded coconut with breadcrumbs as a coating for baked chicken and fish. Shaved coconut or cubed coconut makes a nutritious snack when combined with cashews, almonds, dried cranberries and sunflower seeds. You can make homemade coconut milk for drinking or cooking by blending water and coconut together and squeezing it through cheesecloth. Coconut, Its Role in Health; Wendy Snowdon et al. What Are the Health Benefits of Desiccated Coconut? Any Negative Health Issues From Eating Coconut Flesh?